Would you like to recite a poem? Fancy reading an extract from your WIP? Wish to tell a short story? Or want to narrate a favourite chapter? We provide the microphone and audience, you provide the words! THIS Sunday’s (April 7) NOT The Hay Book Festival is featuring an ‘open mic’ stage as part of the day’s literary activities. A seated food court area will host the audience for anyone brave enough to attempt to entertain them (Not just NWUK members). Providing your words are not offensive, and you bear in mind that children may be present, the stage is yours. It could be your own work or a favourite piece but should be no longer than 5 minutes in duration. Stephen Booth, the best-selling crime writer will be speaking at 1.40pm. His talk will be on ‘A Sense of Place’ and his use of locations. At 12 o’clock, adult fiction author Philip Baker will be discussing where his ideas come from. Alan Oxley will speak of Gasbags and Gliders at 12.40pm as he covers the History of Barton Transport from 1908 to 1989. 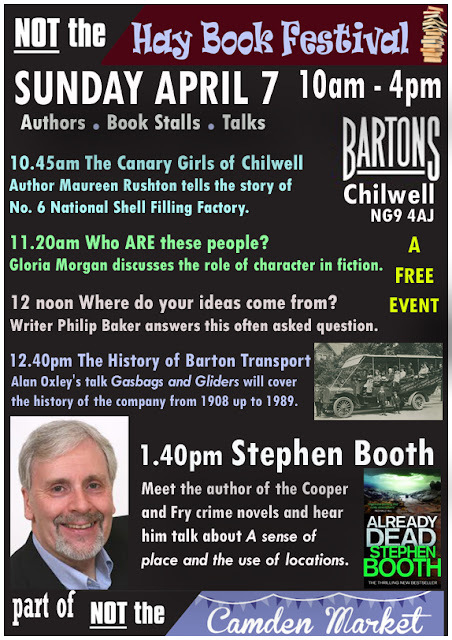 Maureen Rushton will tell the story of the women that worked at the Chilwell Shell Filling Factory during the First World War in her talk ‘The Canary Girls of Chilwell’: Rushton is the author of a book of the same name. Plenty of parking is available at a venue that oozes character and history, so if you’re a fan of the written word, or just want a great day out, get along to Chilwell’s High Road between 10am and 4pm. The event is part of the NOT the Camden Market – around 50 stalls of local crafts and produce.